In Shoedog, we are introduced to Constantine. Brought up in Washington DC, his life has led him to become a drifter with many miles behind him, following his father’s disappointment at him joining the Marine Corps. In the years that followed, Constantine has travelled a lot and had various jobs which never showed up on anyone’s books. On hitching a lift one morning from a man named Polk, who tells him he just has one stop to make before carrying on the journey to Florida, Constantine has no way of knowing that his life is about to change forever. At only 200 pages long, Pelecanos intended this to be a book you can read in just one sitting, which I did. Sitting out in the garden the other day, I read this book from start to finish in a couple of hours. 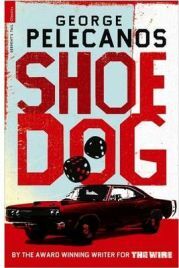 Pelecanos also intended for this book to have a pulp/noir feel and ideally wanted it to be the literary equivalent of the film ‘The Getaway’. Shoedog certainly does achieve the feel the author wanted and I found it quite an easy book to get into. Indeed the beginning was intriguing as Constantine accepts a lift from Polk, an older man driving a sixties muscle car. As Constantine agrees to Polk making a stop off to collect some money he is owed, he ends up becoming involved in Polk’s life in a far deeper way than he could have imagined. Just as the story is getting interesting however, Pelecanos devotes the entire third chapter to Constantine’s previous 17 years. Whilst I could see the importance of some of this as it does help the reader understand the character more, I felt it was somewhat long-winded and didn’t see the need to be informed of so much past history. Constantine’s life has consisted of drifting from job to job on his travels, drinking beer and indulging in women. Whilst reading this third chapter I found I was losing interest and didn’t see the point of his past years being explained in this lengthy sequence. I was eager to get back to the present day in the book and felt this third chapter history could have been condensed more. Back in the present day, the actual story throws up a few surprises in what I had thought early on was going to be a fairly predictable crime/gangster thriller. The characters are well developed, if not too well developed in Constantine’s case. There are also one or two colourful and interesting characters to say the least, in particular a glue-sniffing heavyman and a shoe shop salesman named Randolph, aka ‘Shoedog’. Although this is crime fiction, there is a touch of humour included via these two characters, even if not always intentional. The latter character, Shoedog, particularly gives the book some warmth. The character of Polk was also interesting and I had sympathy for his character as the story unfolds. I found whilst I did not actually connect with Constantine’s character much and he came across as being quite emotionless, especially where women were concerned, there were however, little glimpses of the real Constantine underneath his cold hearted exterior and actions, that ensured that whilst I could find no sympathy for his character, I could not really dislike him. The story is written in the third person which was an exciting diversion for the author who has previously written first person narratives. What Pelecanos has shown here is the ability to quickly establish character, location and plot and ensure an interesting read in just 200 pages. These are skills which surely must have ensured Pelecanos’ successful sideline as a writer for TV. Shoedog grabs your interest from the beginning with a drifter hitching a lift and conversing with the driver. This sets up the story’s concerns about balancing both the random and the planned side of life. It then plods along at a steady pace with the action coming near the end, which is violent but not predictable I may add. There are one or two twists in this short novel and an ending I did not expect. I enjoyed it more than I expected to if I am honest. The third chapter about Constantine’s past saw me losing interest and it was also longer than the subsequent chapters which are shorter, punchier and more fitting with the plot. Overall though, I was pleased I stuck with it, as the book becomes more and more intriguing as it reaches its climax. It felt strange to me whilst reading it, as although I never felt I was totally enthralled by it, I found when I finished reading I was thinking what a good read it was and appreciated how cleverly the author has came up with a good plot, developed characters and included background history. All this and a few twists as well in just 200 pages. He also includes references to the 70’s funk and soul music which features in the story as well as American muscle cars and street dialogue. When thinking of how much I had learned about the characters and all the details of the plot, it did actually feel as if I had read a novel twice the size of this! Shoedog is a gritty story of redemption and revenge which can be read in one sitting and overall I found myself enjoying it much more than I thought I would. Thanks to Serpent’s Tail for providing a review copy of the book.